Get the scoop on the best party hacks for a sweet time! “The people who like Rocky Road, they want it all. Neapolitan means you can’t make up your mind. Vanilla means you’re always true to yourself because you’re not tempted by so many other choices,” said the friend walking in front. After a nice dinner, a group of friends was strolling to their favorite gelateria around the block. A warm Miami breeze tickled at their skin as they strolled from the restaurant to the ice cream shop. Palms overhead rustled up a symphony against the calming backdrop of booming surf on the beach. So your favorite ice cream flavor reveals your personality?” asked another. There was a thought … what couldn’t ice cream do? Was there something deeper than a simple preference underneath their shared love for the brisk frozen texture of the cream and the swift burst of sweetness? “So what’s your favorite flavor?” asked another of the amused listeners, knowing full well their friend was going somewhere. “My favorite – right now,” she grinned and leaning to towards the group, “is sorbet. Because I can eat it even when I’m on a diet. Which I am!” This got a hearty laugh just as the group walked up to the gelateria counter. 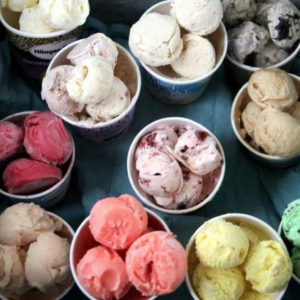 Whether you believe in ice cream personality tests (and horoscopes), we all have a favorite flavor. No matter who you are, there’s an ice cream persuasion made just for you. Because of this, ice cream creates fond memories that stick with us through the years. And no matter which flavor you prefer, there’s no wrong way to have an ice cream party. Have ice cream, get social! There’s nothing better on a hot summer day, for a family get-together with the young ones, or with best friends. Ice cream has a special place in our hearts because it’s customizable. Those little extras are what make ice cream, not just a dessert, but an anytime treat. So add a touch of flair to any cup or cone to create a memorable and truly sweet experience. 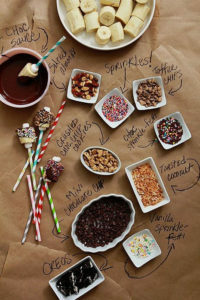 Here are 19 awesome ice cream party ideas for your DIY ice cream catering. From decorations to toppings and everything in between, read on for a total guide to ice cream catering. Stay cool! 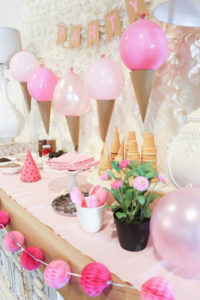 Turn your ice cream party into a 50’s ice cream parlor for a touch of retro-nostalgia deliciousness! Play some 50’s and 60’s tunes in the background and bring in some diner-style stools and small tables. The red, white and blue motif works especially great on the 4th of July. Make malts, root beer floats, and enjoy an old-timey atmosphere like grandma used to. 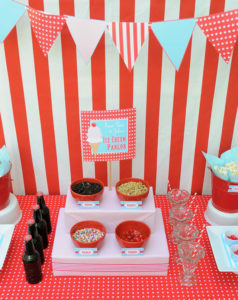 Give party-goers a sweet tooth with these fun, easy decorations. 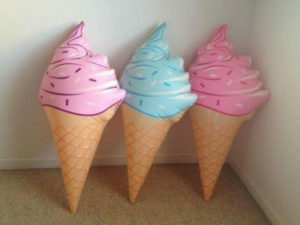 Inflate helium balloons into a shape that resembles a scoop of ice cream. Then attach cut construction paper at the base with some glue or tape. Tie the curling ribbon through and attach to the party area. 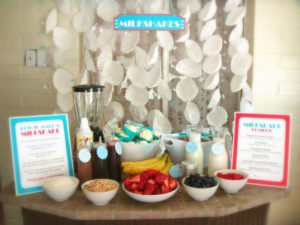 It’s a low-cost and quick way to highlight the treats station! Set up a topping-lovers dessert station just for banana splits. Lay out your favorite nuts, sprinkles, coconut flakes, cookie crumbles (Oreos! ), chocolate syrup, whipped cream – whatever you like. You can even freeze the bananas beforehand to make this an extra-chilly summer delight! Scoop and freeze ice cream on a cookie tray with wax paper underneath. Then stick a popsicle stick into the scoop to make a mini one-scoop cone. Whip these out as guests arrives for bite-sized ice cream hors d’oeuvres. It’s never too early for ice cream! 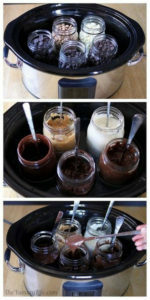 Make your own milkshakes?! Yes, please! All you need is a chest of ice to keep the ice cream and milk cool, a blender, and serving glasses. Then let your friends make strawberry, vanilla, chocolate shakes as they please. Extra points for root beer and vanilla floats. This is instant smiles, guaranteed. 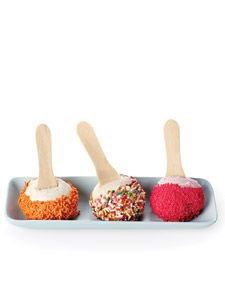 Here’s a fun way to inject a bit of healthy competition into your ice cream social. Have everyone combine their favorite flavors and toppings into a frozen masterpiece, then take photos (before they melt!). Assemble a panel of judges and see who’s looks best. Then…devour! Place a cooler in a wagon and decorate with construction paper and streamers. Use this to greet guests and highlight your ice cream selection. Put a speaker inside with some jingling music to create an atmosphere of childhood nostalgia and sweet treats to come. Cute photos await! Ask your ice cream catering for help with this one. Otherwise, grab some brownie mix and a muffin tin. Bake up these shallow ice cream holders for your party. Combine all the flavor of a brownie sundae with a portable party cup that’s sure to delight your guests. If you’re enjoying ice cream catering by the pool, bring these bright and festive cone floaties. Sure to delight the kids, these are great for the water park or in the backyard. They look delicious, so remind guests not to bite. A great party always has a game to play! Pin the topping on the cone get all ages involved. Keep the atmosphere lively and festive with this classic, reimagined for the ice cream party. A next-level ice cream party always has a fully loaded toppings bar. Present guests with a generous arrangement of candies, sprinkles, fruits, syrups and rarely seen treats. Like what? Try breaking up caramel corn, warm Nutella, crystallized ginger, freeze-dried strawberries, and macadamia nuts. Everyone remembers the best toppings bar they ever enjoyed. Ask your local ice cream catering team for input on this. 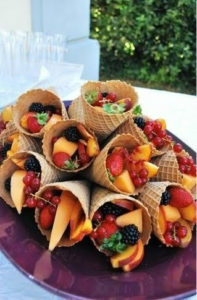 Keep the ice cream spirit alive – with reduced calories – by serving these sweet waffle cones filled with fresh fruit. It’s always nice to offer a healthier option. 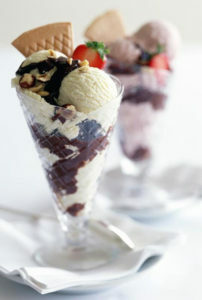 Plus, partygoers can always splurge by adding a fresh scoop of sorbet or their favorite ice cream on top. Everybody wins! When there are lots of guests, all that scooping and dressing of ice cream cones can get a bit crowded. 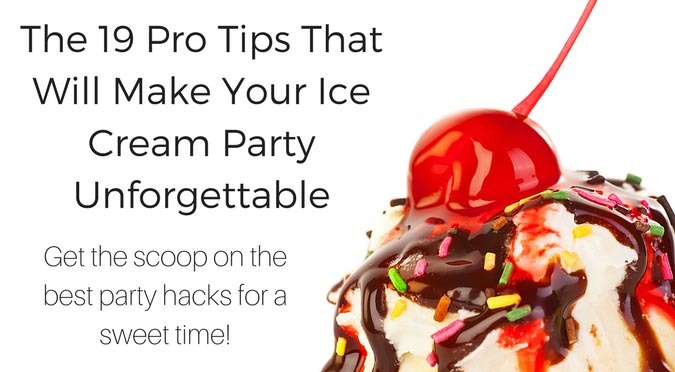 Save time and streamline your party experience by pre-scooping ice cream. Arrange flavors in bowls and bring out when it’s time. As a bonus: it greatly cuts down on clean-up too! 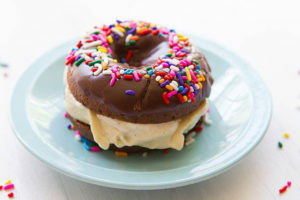 Donut ice cream sandwiches, anyone!? Pick your favorite flavor, slice in half, load with ice cream, add toppings – and enjoy! 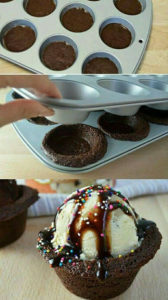 Make your own with a cookie cutter, or ask your local ice cream catering team. Always a favorite! Or the hot caramel topping! 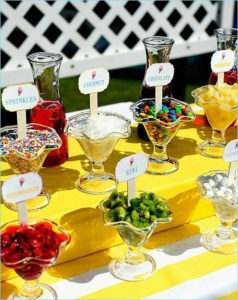 Complete your ice cream sundae bar with hot toppings. Simply place Mason jars in a slow cooker with about an inch of water. Fill the Mason jars with chocolate chips, caramel, white chocolate, or mint chocolate chips – and wait for melted to gooey perfection. Top with abandon! Birthday parties always want an ice cream cake. 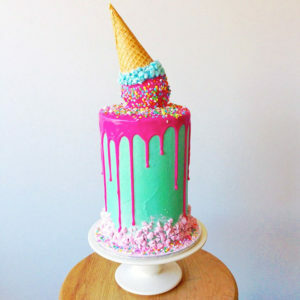 But even if no one’s turning, you’ll wow the party with a truly spectacular ice cream cake. These creative centerpieces bring layer upon layer of creamy, sweet deliciousness – and they’re not bad to look at either! Bring the party to life with this fun-for-ages standby. 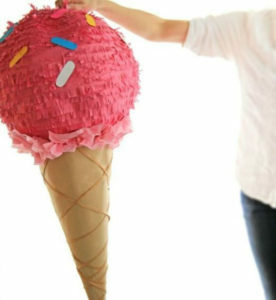 Birthdays, family reunions, block parties: everyone loves a piñata. Fill with your favorite candies and party favors, grab a plastic bat and get the party started! A fixture of many childhoods, the ice cream truck always brings good times. 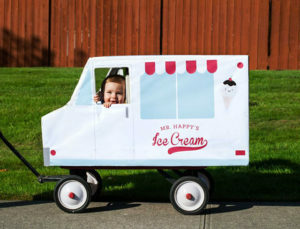 Enliven your ice cream party with a real ice cream truck that will delight everyone. There’s no easier way to ensure your ice cream catering is a flawless affair that’s remembered by children and adults of all ages. No matter what type of party you’re having, ice cream is always welcome. Perfect for those hot days or warm Miami nights, kids and adults can’t resist this sweet creamy treat. As we’ve seen, there are so many ways to dress up your festive occasion. Hopefully, you’ve found some inspiration to make your next birthday party, family gathering or event one to remember. The only question is: how will your ice cream catering make your party truly special?